Hello, everyone! I hope you're all doing really well! Today, for my second Game Spotlight I thought I would stick with the Retro theme and highlight an old NES game that really had a lot going on. That game is Blaster Master, released in 1988 by Sunsoft on the Nintendo Entertainment System. When the game came out in Japan under the name Chô Wakusei Senki Metafight, it didn't sell very well, so Yoshiaki Iwata and Sunsoft moved onto another project. However, when it came out in the west, it took over the hearts and minds of players and critics alike. Iwata would not become aware of the game's success until much later. 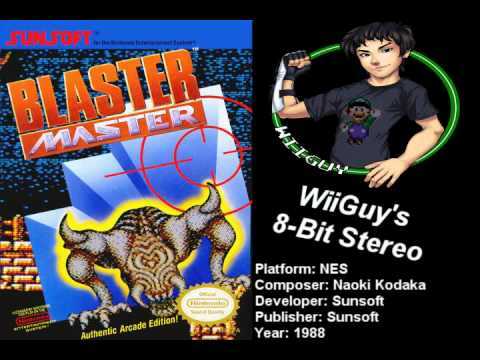 Blaster Master has you taking control of a young boy named Jason. He chases his pet frog, Fred, down a hole that seems to have opened up in his back yard. There he finds a wheeled tank named Sophia the 3rd, which he hops into to help chase after Fred and deal with the numerous mutants he'll encounter along the way. This narrative is exclusive to the western version, as the original Japanese one was a lot less creative in its story. The game is a hybrid of a side-scrolling platformer and an overhead run-and-gun style game. Jason can exit Sophia at any time, but doing so means he's a lot less powerful. It does allow him to access areas that the tank can't get to, and these will usually lead to the overhead stages which will have the level boss and a powerup for Sophia. These powerups will let the tank reach areas that it would normally not be able to get to. It makes the levels non-linear, as you'll often have to backtrack to get to where you know you saw that unreachable platform that you can now reach because you have upgraded jumping ability, for example. The overhead stages are a bit tricky, as the hit detection can be a bit weird and you may find that you're taking hits that really shouldn't have connected. Navigating around spikes and other hazards is made harder as a result. This is less of an issue when fighting bosses, as you'll generally be fighting them on a black screen with little else going on, so you can focus on just avoiding its attacks and dishing out your own. Whether it be with your blaster gun or grenades, you'll have a hard time ahead. Blaster Master is not an easy game. A handful of the bosses can be taken out easily enough using the grenade and pause glitch, but others you'll have to deal with the old fashioned way, with dexterity and pattern-recognition. One of the other cool things about Blaster Master was was how big the levels were. The NES wasn't really capable of holding a lot of data in memory, so the folks at Sunsoft had to resort to some very clever tricks to pull off such large levels. It also had a really excellent soundtrack that stands as one of my all-time favourite NES soundtracks. This is a game that's absolutely well worth your time to track down. Game cartridges can still be found for less than $10, and there are now new NES clone consoles that hook up via HDMI that will allow you to play them on modern TV's. It's also available on the Wii U Virtual Console, and on 3DS if you have one of those. There is also a new entry in the series called Blaster Master Zero for the 3DS and Switch that I'll likely talk about later, as well. For now, though, I hope you enjoyed this look back at one of the best NES games of all time. The years, too. Man, Daryn, what a nostalgia trip. I was never able to finish the game until I finally played it on PC emulator. It was only because I was able to 'Save State' and come back to it later, that made it so I had the energy and time to go all the way through it. Even with Game Genie, it was impossible for me to finish pre-emulator. The game was just way too long, and the later stages too difficult. My brother loved the game, too. On some weekends, we'd hook it up, complete with Game Genie, and take turns, each of us playing a life, doing our best to finish it, while gobbling down pizza and laughing at each others deaths. We'd even leave the console on after we'd become too tired and had to go to bed, coming back to it the next morning. God, what a rush it was when we finally got the hover powerup, but we were never able to finish the game. It was maddeningly difficult in its upper levels. As I recall, Sega later attempted a sequel, but it was trash. You told me though that Nintendo has done one for one of its newer consoles and it's not bad. It may be that I will finally break down and buy a console system just so I can play it. I haven't owned a console of any kind in decades. This title would be the only thing which may prompt me into buying one. Thanks for the blast from the past, dude. Blaster Master. One of my all time favorites. I'm glad you liked this one, man. It's a classic, no doubt. I don't have the same kinds of memories about that game. I remember a lot of gnashing of teeth while playing it. With a game Genie though, it did make the game more manageable. The grenade glitch also helped a LOT. I think next time I'll tell you all about the new one.